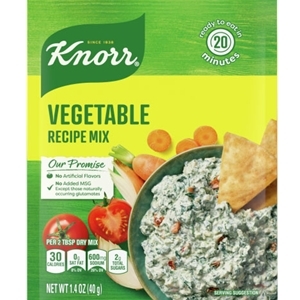 Knorr Vegetable Recipe Mix is a symphony of flavors thanks to the presence of carrots, onions, tomatoes, celery root, leeks, cabbage, cauliflower, green peas and potatoes. 1.4 ounce. Combine 4 cups water and Knorr Vegetable Recipe Mix in a medium saucepan. Maltodextrin (corn, potato), salt, corn starch, dehydrated carrots, dehydrated onions, dehydrated tomatoes, dehydrated leeks, dehydrated cabbage, high oleic sunflower oil, tomato powder, dehydrated soy sauce (fermented soybeans, wheat, salt), onion powder, dehydrated green peas, yeast extract, sugar, disodium guanylate, disodium inosinate, broccoli powder, garlic powder, potassium chloride, caramel and turmeric (for color), spice, sulfites (used to protect quality).